Who Dropped This Entire Chicken Dinner Over The Sidewalk? 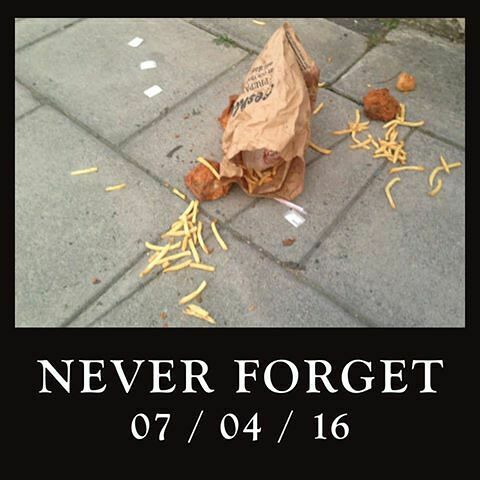 Never forget the 7th April 2016, remember this dark day people. Always remember. All around the world KFC fans have been mourning the terrible tragedy that happened in happened on that day in Cheltenham, England. The tragic event involved the sad loss of an entire KFC chicken feast dinner, the result of some poor unidentified soul who had most probably dropped the entire contents of their meal all over the sidewalk. The heartfelt response from the internet to the disaster has sent Twitter into complete meltdown as people ponder how it happened and whose dinner it might be. The Gloucestershire Echo first reported on the sad story, detailing how the chicken was found lying all over the ground and asking people: is it yours? People then began reacting on Twitter, lamenting the loss of a whole meal like this and who had to suffer such a woeful catastrophe. They also wondered why more outlets weren't covering the breaking story, and trying to track down the owner. It certainly struck a chord with fellow chicken eaters, that's for sure. There was also initial speculation about why animals—foxes, birds, stray cats, passing dogs— hadn't eaten the food, some commentating that it was a damning indictment on KFC and the food's taste. But soon only the fries were left. Our thoughts go out to the people of Cheltenham at this very difficult time. Here's the photo of the chicken loss. Be warned, this imagery might be deeply upsetting for some people. And here's some of the fun reactions. Why isn't the BBC covering this? After processing that, you'll be glad to hear the Gloucester Echo have used all their journalistic power to track down the owner of the dinner. It was a student called Callum Meek who explained what happened, "The handle just broke, but I didn't really think about it until the next morning." The world's thoughts are with you at this difficult time, Callum.